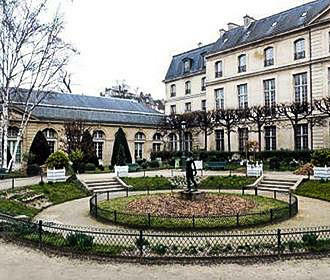 This beautiful mansion house in Paris was first constructed in 1688 within the historical Marais area of the city and is now part of the Musee Carnavalet that holds the museum of the history of Paris with items like dug out canoes from 4000BC. The building itself was designed by the architect Pierre Bullet, who was the chief architect to the king and the city, and it was designed for Michel le Peletier de Souzy who was a State Councillor and the Intendant des Financies. The building itself is styled classically for the time between a courtyard and garden, but has an unusual design compared to many, where the main facade has four very wide bays, whereas the side facades have close and more regular bays. Yet the monumental facade that faces the garden is much wider and has ten bays. The only decorations to be found in the courtyard are the building staples on the keystones of arches that are located above the windows and doors on the ground floor, and these keystones are the final pieces of stone placed to lock everything together. 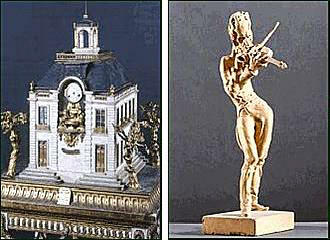 But there is also a central pavilion that has two bays and this is embellished by a pediment, or the classical style of the upper part of a facade, which depicts a figure of time, being Saturn holding a scythe with an hourglass that is resting against a column with a dial for the hours. At a 90 degree angle from this facade is the Orangery, that is a single story building with thirteen windows and a pediment over the central door window that depicts a figure of truth, and both of these releifs were designed and produced by Laurent Magnier. However, when it comes to the interior of the Hotel le Peletier de Saint-Fargeau, unfortunately, there are only a couple of the original parts of decor that have remained in place from when first constructed. 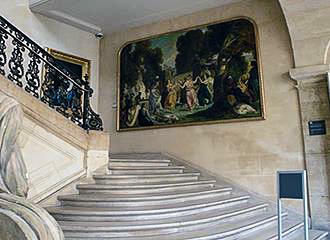 In fact, only the central staircase that was made of cast iron for the banister, which is the first known example of the technique used in France still remains, along with the chamber of mirrors that truly emphasises the wealth of the original occupant and the splendour in which was conceived by the architect. Over the years, the Hotel le Peletier de Saint-Fargeau was passed down through the generations from father to son, and the most famous occupant of this mansion house in Paris was Louis-Michel le Peletier de Saint-Fargou who was the great grandson of Michel le Peletier de Souzy, that inherited the property in 1779. 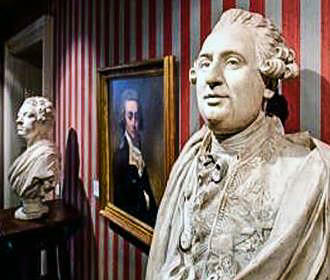 Louis-Michel le Peletier de Saint-Fargou joined the Third State in 1789 and became one of the most passionate defenders of the peoples cause during the French Revolution, and he voted for the execution of King Louis XVI in the January of 1793. It was the same evening of the 20th January 1793 that he was stabbed while dining at the royal palace, and taken back to his home, he died the following day only hours before the king was executed. He was declared a Martyr for Freedom during the Reign of Terror in the French Revolution and provided with a grand funeral, then his remains were transferred to the Pantheon, but his family removed him from the Pantheon a couple of years later. And just to add a twist, the daughter of the person who killed the king, married her cousin Leon le Peletier de Morfontaine, but because they were already living elsewhere, they decided to sell the Hotel le Peletier de Saint-Fargeau in 1811. From then on, this mansion house in Paris changed hands many times and was also used for educational institutions several times and even by the French postal company, then in 1895 it was purchased by the city of Paris. Before we get ahead of ourselves here, we would like to go back a few years again..
You see, there was once a library of the history of Paris that was held at the Hotel de Ville, or Town Hall, but this was destroyed during the Paris Commune in 1871 when the town hall was set on fire. And a new Bibliotheque Historique de la Ville de Paris was established by the librarian Jules Cousin from his own personal collection, and this was set up at the Musee Carnavalet in the Hotel Carnavalet. But from when this was first established in 1872, over the next few years it continually expanded, and this was the reason why the City of Paris decided to purchase the Hotel le Peletier de Saint-Fargeau in 1895. So, by 1898, the entire Bibliotheque Historique de la Ville de Paris was transferred to its new location and became an annexe of the Musee Carnavalet. 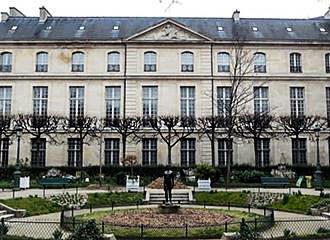 But in 1968 the Library of the History of the City of Paris was relocated to the Hotel Lamoignon due to wishing to expand the Musee Carnavalet. And the library is still located at the Hotel Lamoignon to this day. 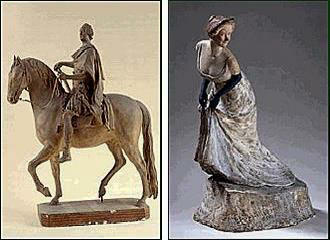 However, even though the idea was to expand the Musee Carnavalet into the Hotel le Peletier de Saint-Fargeau, the project did not actually start until 1984, and after five years and a lot of work, eventually this new part of the Musee Carnavalet opened its doors in 1989. And connected via a gallery on the first floor from the Hotel Carnavalet to the Hotel le Peletier de Saint-Fargeau, this museum in Paris has maintained some of the traditional aspects and origins of the original Carnavalet museum, by featuring interior decorations from different buildings in the city such as a unique drawing room from one of the hotels in Paris. So, as you can tell, this is not just a truly historical monument in Paris, it is also a very apt mansion house to hold the history of the city, and has become one of the popular tourist attractions in Paris that you can visit to learn even more about this incredible city.